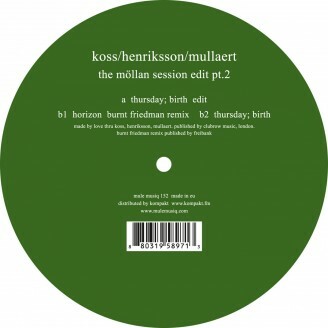 2nd edition of remix single from the collaboration album of koss & minilogue - the möllan session. a side, new edit version is floating deep house tune. it reminds me "smallville" classic "stl-silent state". this tune will be for all round of house & techno lover. on b side, our very favorite german producer "burnt friedman" joined as remixer. you can imagine his remix very easily if you listened his latest album "bokoboko". it's unique, special and original. beautiful original version of "Thursday; birth" is first appearance on vinyl.